Jubilee Life has been a venerable supporter of sports in the country with the brand essence being ‘Live Free’. 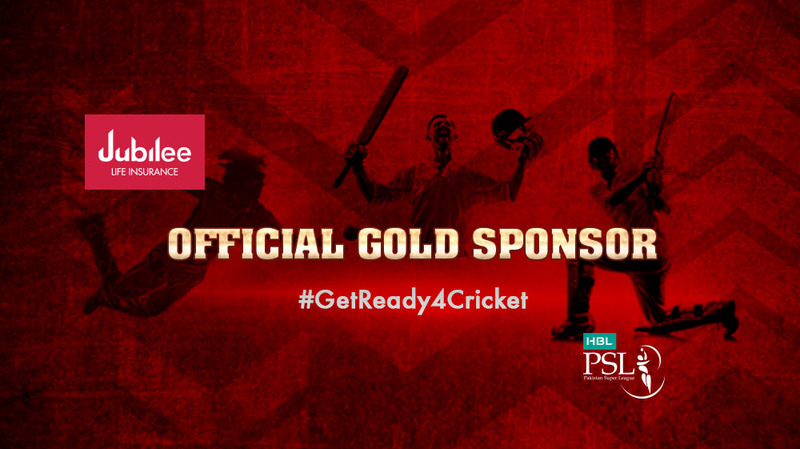 The company was the gold sponsor of the recently concluded PSL 3. Jubilee Life was also the lead sponsor of the Pakistan Super League (PSL) outfit Quetta Gladiators last season, as well as, being the gold sponsor of Pakistan versus Sri Lanka T20 cricket series. Other than cricket, Jubilee Life has also lent its support to other sports in Pakistan including snooker, pool and golf. Jubilee Insurance is a global brand of Aga Khan Fund for Economic Development (AKFED) that offers diverse insurance solutions (life, health and general) and is committed to the vision of being Pakistan’s best service provider from the insurance industry and is among the top 25 companies of the Pakistan Stock Exchange; it happens to be the only insurance company to make it to this prestigious list. Jubilee Life has been the pioneer in Bancassurance distribution and is the market leader among private sector life insurance companies in Pakistan. With an average growth of 38% over the last five years, it is the most profitable and valuable life insurance company on the stock exchange.